When I arrived at the Castro Theatre yesterday evening to catch the festival screening of All About Eve, I found Marc Huestis struggling to position Matthew Martin in a photograph that would show off Martin's billing on the Castro marquee. He had him dangling from a tree and Martin was jokingly complaining that he was getting exhausted. I stole a hug from Martin ("Because I love everybody") before he transformed himself into Bette Davis and belted out a truly amusing cover of "I Will Survive." It made me seriously wonder why Bette Davis didn't reconfigure herself as a disco queen? Then again, some questions might best be left unanswered. Following Matthew Martin's comic impersonation of Bette Davis, the B.A.R. 's Tavo Amodar once again took the Castro stage to offer insight into the costumes for All About Eve. In Steel Magnolias beauty salon owner Dolly Parton tells aspiring hairdresser Darryl Hannah, "Remember: there is no such thing as natural beauty." She was right of course and Hollywood during its Classic era understood that very well. The major studios employed hundreds of behind-the-scenes professionals: make-up artists, hairdressers, lighting technicians and costume designers whose goal was to make their contract stars look as beautiful as possible. Tonight, as part of Marc Huestis's Fabulous Fashion in Film Festival, we'll be honoring the work of two remarkable designers: Columbia's Jean Louis (who was born in 1907 and died in 1997) and Paramount's Edith Head (who was born in 1897 and died in 1981). For Gilda, Jean Louis created an extraordinary strapless gown worn by the love goddess Rita Hayworth while she performs her fully-dressed strip tease and sings "Put the Blame on Mame." This dress is critical to the story. Gilda wears it to flaunt her sexual desirability and embarrass both her ex-lover and her cold husband. …It was a difficult dress to make. The bodice had to be wired to provide Hayward with breast support, allow her to dance suggestively, show cleavage yet keep the censors at bay. Additionally, Hayward was three months pregnant so the designer had to cut the gown to hide any hint of her condition. Although he never—and it's inexplicable—won an Oscar, Jean Louis was hugely influential. In 1953 he created the swan-feathered coat and breakaway see-through gown worn by Marlene Deitrich in her legendary cabaret act. That ensemble was the precursor to many of the designs Bob Mackie created for Cher. 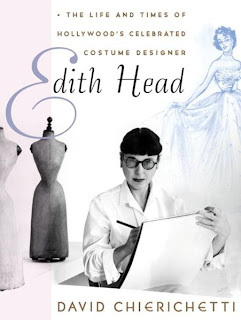 Unlike Jean Louis, Edith Head won more Academy Awards—eight!—than any other designer. She was versatile, hardworking, a tireless self-promoter and encouraged people to think that she was a lesbian because she felt it would help her in a profession dominated by gay men. [Her Wikipedia entry states: "An interview with Edith Head was included in Boze Hadleigh's book Hollywood Lesbians. While the designer did not confirm or deny her sexuality in the interview, gossip about Head from other sources such as actress Elsa Lanchester, reportedly herself a lesbian, has led some to claim that Head was also homosexual."] If necessary, [she] took credit for the work of others. In 1954, for example, she collected an Oscar for Sabrina, even though Audrey Hepburn's gowns were designed by the uncredited Givenchy. 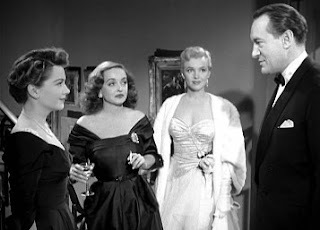 Head's most famous dress was the one worn by Bette Davis during the justly-celebrated cocktail party scene in All About Eve. Her involvement with Eve was accidental. The film's original Margo Channing, Claudette Colbert, broke a vertebrae just before filming on location at San Francisco's Curran Theatre. Production couldn't be delayed for Colbert's recovery and she had to be replaced, which is how Bette Davis got the best part of her long career. Charles Le Maire had designed all the costumes for the movie, including those for Colbert. Those clothes, however, wouldn't work for Davis who was very different from Colbert in appearance and personality. 20th Century Fox had assigned Le Maire to another film and, therefore, followed Davis's suggestion to borrow Head from Paramount to create her wardrobe. A few years earlier Head had designed Davis's clothes for a war comedy called June Bride and the star had been impressed because the costumes weren't an end in and of themselves but served to underscore the characterization. Working under enormous time pressure, Head delivered the cocktail party gown to Davis moments before she was expected on set. To her horror, the dress was too big across the bodice. Davis solved the problem by pulling the dress down over her shoulders. Both she and Head were delighted and the gown now perfectly reflected Margo's belligerence and insistence that she was still attractive, despite encroaching age. Years later, however, Head complained of the difficulties in designing for Davis because of her short neck, round shoulders, pendulous breasts, thick waist and bow legs. Bitchy bitchy bitchy, Edith! 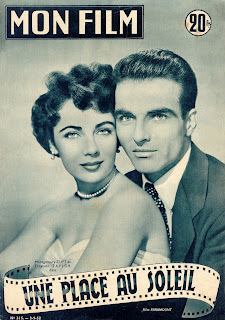 Head's most influential gown was worn by 18-year-old Elizabeth Taylor in 1951's A Place In the Sun in the famous party scene where she and Montgomery Clift fall in love. The full-length white lace with chiffon dress highlighted Taylor's beautiful shoulders and bust, accentuated her small waist, and made the tiny star look taller. It didn't detract from her breathtakingly beautiful face. The gown was copied by two generations of prom-going high school girls. 20 years later Taylor asked Head to update the dress … for her to wear to an Academy Award show. When asked about her most unusual assignment, Head didn't hesitate to respond. It was from another Hollywood legend. In February 1965, the 1964 Oscar nominations were announced with My Fair Lady garnering the most nods, including one for openly gay George Cukor as Best Director. Almost immediately, Joan Crawford telephoned Edith Head to say she would be presenting the Best Director Award. The shows were still telecast in black and white and—in honor of the movie's Ascot ball scene—actresses were asked to wear white or the other shade at the ceremonies. Crawford and Head had agreed on a beautiful silver-beaded dress. About a week before the show Crawford called Head asking for a second version of the dress but made of black bugle beads. Head asked why she needed two dresses for one night? Crawford answered, "Because Deborah Kerr is presenting the writing award right before I go on. She refuses to tell me what color her dress is. If she goes on in black, I'll switch to silver. If she goes on in white, I'll wear the black. My diamonds will go with both." Crawford arrived in silver and was back stage when Kerr emerged from the dressing room in white chiffon and sailed out onto the stage. Crawford quickly changed into her black gown, regally followed Kerr, and announced her old friend George Cukor the winner. Said Head, "She left nothing to chance. That's why she was Joan Crawford." Information about the Jean Louis ,is pretty impressive and the pictures are great to see.